A Korean Odyssey Hwayugi, this Kdrama is one of 2018 Korean Drama I want to watch and share the recaps to my audiences. 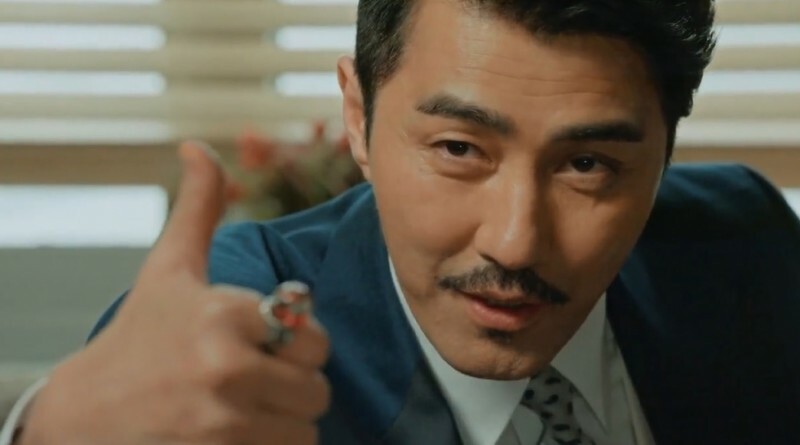 In the 3th episode of A Korean Odyssey Hwayugi Kdrama, Son Oh Gong wants Jin Seon Mi to take off Geum Gang Go for him, but she refuses it and signs the contract with Woo Ma Wang. In the latest episode of A Korean Odyssey Hwayugi Kdrama, Jin Seon Mi gains the ability to transfer death blood into zombie, although the zombie doesn’t attack human in the Korean drama. At the end of A Korean Odyssey Hwayugi Korean drama episode 3, Woo Ma Wang also reveals why he has to become deity in the kdrama, because he wants to save his lover. Son Oh Gong appears and saves Jin Seon Mi after she called his name. He tells her that she don’t have to use her blood to summon him and there is a problem that he loves her since he wore Geum Gang Go. He cures her wound and gathers all of her bloods transferring them into blood butterflies to send them away. Woo Ma Wang gets angry after he knew Jin Seon Mi released Son Oh Gong so that she will be eaten by him, his assistant and Pk persuade him to calm down. Then he is told that Son Oh Gong fell in love with Jin Seon Mi because of Geum Gang Go. Woo Ma Wang thinks it’s not a bad idea. Son Oh Gong wants a kiss from Jin Seon Mi, but she refuses it and thinks he tricks her. Son Oh Gong lets her to take off Geum Gang Go for him, Jin Seon Mi thinks he won’t protect her after she does so. Son Oh Gong tells her that he has to stand by like a dog because of Geum Gang Go, but he is a monkey not a dog. The blood butterfly enters a dead girl and transfers her into zombie. She frightens away two men who is going to bury her. Jeo Pal Gye finds Son Oh Gong’s car when he is out of a night club and returns to home with a woman. He transfers into a wild boar and runs away, but he is caught and taken to Sa Oh Jeong’s office. Jeo Pal Gye kneels down in front of Son Oh Gong and tells him that Woo Ma Wang gave the Geum Gang Go to Jin Seon Mi and burned the devil’s picture. Son Oh Gong isn’t intention to fight Woo Ma Wang because the case of Princess Iron Fan, but he wants to give him a lesson. Woo Ma Wang gets tons of calls from his friend they think he caught Sam Jang and want to eat her. Meanwhile, Peacock Gong Jak begs Woo Ma Wang to let him bite Sam Jang to enhance his features, but Woo Ma Wang just gives him a green grape candy instead. Son Oh Gong asks Woo Ma Wang why he gave Geum Gang Go to Sam Jang, Woo Ma Wang replies that he wants to stop him from eating her. Son Oh Gong begs Woo Ma Wang to kill her as she refused to take off Geum Gang Go. Jin Seon Mi looks at wound on her palm and misses Son Oh Gong. Just then Son Oh Gong appears and lies beside her, Jin Seon Mi asks him why he comes as she didn’t call his name. Son Oh Gong tells her that he will appear when he thinks about him and open her fridge, finding she didn’t store any food in it. She tells him that she doesn’t have friend and family, so she doesn’t need it. He tells her that she has one that is him and asks her to take off Geum Gang Go. She refuses it again. Woo Ma Wang visits Jin Seon Mi and asks him to sign a contract with his company. Her assistant thinks she is going to be a star, but Woo Ma robs Son Oh Gong’s points after he kills evil spirits according to the contract. Jin Seon Mi thinks he is too pity and is going to reject it, but Woo Ma Wang tells her that he will take back Geum Gang Go if she refuses to sign. The zombie girl Jung Se Ra finds Jin Seon Mi who is feeding a child ghost with popcorn and picks up the paper which Jin Seon Mi left. Jin Seon Mi visits her uncle but he doesn’t let her in when she wants to put popcorn on the table of her grandmother memorial. Fortunately, his daughter Mi Joo doesn’t exclude Jin Seon Mi and has a dinner with her. But she asks Jin Seon Mi for money to solve his husband’s financial problem. Jin Seon Mi sees a evil spirit siting in Mi Joo and his husband’s car and tries to reminds them, but they don’t listen to her and think she is a mad. Just then Son Oh Gong appears and helps them kill the evil spirit, but Mi Joo doesn’t have any thank and blames Jin Seon Mi. Jin Seon Mi tells Mi Joo that she isn’t her family anyone and decides to stop aiding her. Jin Seon Mi asks Woo Ma Wang to let her be a normal person after he becomes deity, Woo Ma Wang accepts it as Sam Jang will leaves her after she completes her mission. Jin Seon Mi thinks there is someone waiting for Woo Ma Wang so that he cannot wait to be deity. Son Oh Gong asks Jin Seon Mi to take off Geum Gang Go for him after he sent the popcorn to the table of her grandmother memorial, but she tells him that she cannot as she signed the contract with Woo Ma Wang. Son Oh Gong tells her that her assistant Lee Han Joo is in danger, but he refuses to protect him as he can only protect Jin Seon Mi according to the contract.